Panasonic at CES 2016: 5 things we learned | What Hi-Fi? A new 4K LED TV range, the Technics Grand Class SL-1200G turntable and a much-anticipated 4K Blu-ray player are the highlights from Panasonic at CES 2016. Panasonic's CES 2016 press conference may have involved a lot of talk about the company's deep involvement with the infrastructure of an entire city (Denver, Colorado) but also included several extremely interesting home entertainment stories. Here are five key points from Panasonic at CES. There's at least one 4K Ultra HD Blu-ray player - the DMP-UB900 - coming to Europe in the spring of 2016. Pricing is yet to be confirmed, but we're told it will be shy of 1000 euros. We'll keep an eye out for the full specs of the player (not to mention some discs). Panasonic's range of 4K TVs (currently one of the widest on the market) will get wider still in 2016, with the introduction of the DX900 series of UHD Premium-certified LED TVs. 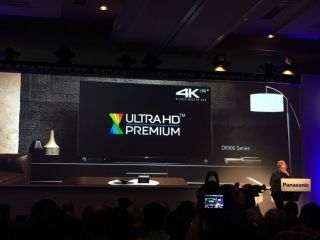 UHD Premium is a recently devised standard for HDR 4K from the UHD Alliance. The Technics Grand Class range of stereo separates (unveiled at IFA in Berlin last September) now officially includes the SL-1200G direct-drive turntable, an updated reworking of a genuine hi-fi (and DJ) classic. And it looks rather lovely. Panasonic has partnered with Grammy Award-winning engineer/producer Elliott Scheiner to produce a cutting-edge in-car entertainment system (called the ELS Studio) for 2017's hotly anticipated Honda/Acura NSX supercar. We expect plenty more by way of in-car entertainment news throughout the week.